While it doesn’t have a grand, overarching designation, you can think of Google’s recently announced revamp to its smartwatch platform as the third version of Wear OS (though officially, it’s 2.1). It’s got an all-new UI, updated health and fitness tracking, better app integration, and more, and it all should be headed to your device starting today. The update should be available for any smartwatch released after the Android Wear 2.0 (now called Wear OS) rollout back in February 2017, though that may depend on how fast each individual watch maker can verify and push out the patch to its devices. To see if there’s an update waiting for you, go to your device’s Settings view, tap About, and then System updates. The most important change for the new Wear OS is a newly streamlined interface that lets you access the smartwatch’s most important features with a single swipe. 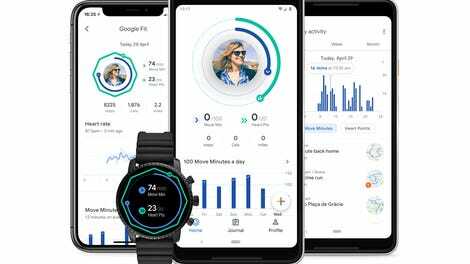 Swiping left will bring you to Google Fit, which was recently overhauled with new “Move Minutes” and “Heart Points” statistics to help give you a better sense of your daily activity. And Swiping right will call up the Google Assistant, which has been enhanced to be smarter and more proactive about providing you with tips like traffic alerts and potential flight delays. Meanwhile, swiping up is a quick way to parse through notifications, while swiping down will give you access to handy shortcuts for features like Google Pay. So for all the people who may have gotten tired of their Wear OS device and stashed it in the back of a drawer, now might be a good time to dig it out and see how you feel about the new Wear OS. However, if you’re thinking about buying a new Wear OS devices just to check out the update, you might want to hold off. That’s because Qualcomm recently announced a new smartwatch chipset that features a number of performance and power efficiency updates that should make Wear OS function even better. Unfortunately, there aren’t any devices featuring the new Snapdragon Wear 3100 chipset on sale at the moment, and the handful of watches that have pledged to use the new chip like the Montblanc Summit 2 don’t have official release dates, which means it might be another couple months until we actually get next-gen Wear OS devices.